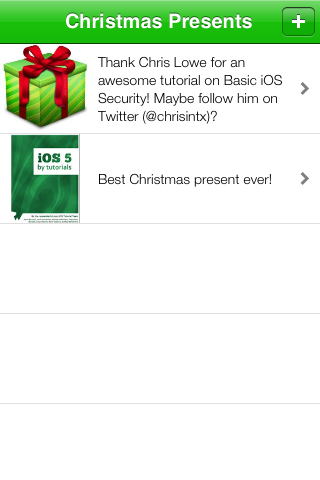 This is a post by Chris Lowe, an iOS application developer and aspiring game developer living in San Antonio, Texas. Welcome to Part Two of the epic tutorial series on implementing basic security in iOS 5! In Part One, we began work on Christmas Keeper, an app designed to keep track of holiday gift ideas. We built out the shell for our app and put it under lock and key via prompting the user for a PIN/password. In the process, we learned a little about hashing and cryptography. In this second and final part of the series, we’ll tackle using the iOS Keychain and Data Protection API, as well as several more segues and the new Twitter API. This tutorial starts where the previous tutorial left off, so if you don’t have it already, grab the project where we left off last time. Read on to get even more security-savvy! Before we jump back into the app, let’s take a deeper look at the methods in the KeychainWrapper class. These methods are all helper methods to help you manage items in your keychain. The keychain in iOS (and Mac) is a highly secure location inside of the OS that is the de facto storage location for user names, passwords, logon tokens, secret keys, etc. It’s a feature provided to you out of the box, with the additional “benefit” of being C-based (so it’s faster). The keychain is located OUTSIDE of your application, you just have access to it (via the provided API). This is important should your application ever be compromised (read: jailbroken/rooted) and someone has access to all of the information in your binary. The keychain is encrypted and managed for you – going the route of saving to a PLIST, Core Data database, etc. saves files in plaintext so you’ll need to manage the encryption of it yourself (not a trivial task). Plus, that’s where Apple saves their data too, seems like a safe bet to me :). The keychain can be migrated for you automatically across backup/restores so the user can pick up from where they left off. That being said, the keychain is an I/O monster and is not meant for large amounts of data – if you have many sensitive data elements, you might need to consider something like a Core Data database and roll your own encryption, unfortunately. Also, just because the password is hashed and more secure, does not mean we are free to post it to Twitter for all to see! It’s still sensitive information and, again, given enough time and computational horsepower, can be broken so it’s best to store it somewhere to safer. Likewise, each app has its space in the keychain, and this keychain access can be shared across apps (typically within the same company, not cross-company). As you’ll see in the code, jumping from Objective-C to Core Foundations (C code) while using ARC makes for some interesting keywords that are easy to miss and misuse. In general, the most common keys you are going to set in the Keychain are below (take from Apple’s sample code at the above link). Here is how to read the keys: “k” is an Apple (perhaps Industry) standard for a Constant (usually defined in an enum). “Sec” means Security. “Attr” means Attribute. The remainder is what the attribute is, for example “Label” is the Label for the Keychain entry. This key uniquely identifies the “Service name” for our key entry (remember, the Keychain is a shared repository). In this instance, we are just using our App Name (ChristmasKeeper, from our Constants.h class) which is pretty unique but another popular option is your company name in reverse-DNS notation (com.raywenderlich.iOSSecurityFTW). These two lines of code specify WHO will be accessing our keychain. We are using the same identifier for both to keep things simple, but you can specify different values for each. This is the actual data that we are saving which, in our case, is the hashed password from the user. Here we are specifying that we are storing a Password which is the most common type of entry for iOS. You can also store “Internet Passwords” and certain Certificates but this is mostly for Mac usage. Technically, we should only get one result back from our search – if we get more than one back we either didn’t specify a specific enough search and/or our keychain entry wasn’t unique enough. In any event, we only want one back, so we specify that here. This last one is a bit hard to read, but what it is saying is that when we do a search for a keychain value, we are going to get something back and we have the opportunity to specify what that return type is. In this case, we want “Data” back, which just happens to be CFData which we later change into the familiar NSData. Now let’s look at each method individually. You can think of this method as the foundation for the rest of the keychain helper methods. This method sets up all of the default parameters needed to easily reach the keychain. I’d call this method the “raw data” method. It searches the keychain for the value we’re requesting, but it returns it as an NSData object. We then have to manually manipulate it ourselves. This is what actually searches the keychain. It takes in search parameters (via searchDictionary) and an output parameter (foundDict). This is really the method you want to use for searching the keychain, because it returns the value found as an NSString, which is much easier to compare against another input value (such as the password entered by the user). This method writes to the keychain. We use “SecItemAdd,” which is the key line of code that physically writes to the keychain. This limits when the key can be accessed. We also check to see if the key already exists. If it does, we update it instead of creating a new one or deleting the old one. Like createKeychainValue, but updates a value that is already in the keychain. A simple method to delete a keychain value. A convenient method that compares the input value (in SHA256 encrypted format) to the value in the keychain. Remember, we used these methods in the last tutorial in ChristmasRootViewController.m’s textFieldDidEndEditing method. Now that you understand how the keychain methods work a bit better, walk through how the code and make sure you fully understand how it works now. Now back to our Christmas Keeper app. When we left off last time, we had finished implementing user authentication, necessary to protect the user’s Christmas lists from prying eyes! Successful authentication should have brought us to our UITableView of Christmas presents, but currently our app is missing logic to handle anything with the table, so let’s remedy the situation. // Exposed method to load the data directly into the 'christmasList' mutable array. // Helper method to ensure that we have a default image for users who don't specify a new picture. // Writes JSON file to disk, using Data Protection API. // Should someone delete a present, we can remove it directly, then save the new list to disk (saveChristmasGifts). // Should someone add a present, we can add it directly, then save the new list to disk (saveChristmasGifts). // Accessor method to retrieve the saved image for a given present. // Accessor method to retrieve the saved text for a given present. // Accessor method to retrieve the saved image name for a given present. The first thing we do is create an array to actually hold our Christmas elements (which will just be a dictionary). For the rest of the header, we have several methods for setting up our Christmas list, as well as for accessing details about individual presents. Read through the comments to get an overview of what they will do. // Helper method to get the data from the JSON file. // Helper method to save the JSON file. // Here we are write-protecting the file, then we are setting the file itself to use File Protection (Data At Rest). // We wrap our Gifts array inside of a dictionary to follow the standard JSON format (you could keep it as an array). // This method ensures that we always have an image available in case the user doesn't specify one. This method is our “default initializer.” This is the method we want people to use when creating our class. In this method, we initialize our array to whatever we find in our “dataFromJSONFile” method. We also save some placeholder images for later use. In this method, we look for a specified JSON file in our documents directory. If we find it, we return the list at key “gift.” If we don’t find it, we create a basic single-element array and return that instead. When someone adds/removes/changes a gift, we call this method to write the JSON list to disk so that we can always have the latest Christmas Gift list saved. Saves our default present image so that all of our images are stored in one place. Returns the text (the present details) for a given present (at index). Same as above, but for the image of the actual present. Same as above, but for the image name of the present. This is important so that we can pass the name of the picture around instead of the actual picture. We provide the ability for people to delete presents from the list. This method deletes the image associated with the deleted present. We add the present to our array and update the JSON file. We can also remove presents. This method deletes the present image, removes it from the array, and updates the JSON file. The most important security-related code here is the saveChristmasGifts method. This method writes a JSON file to disk using “NSDataWritingFileProtectionComplete,” which protects our file from being accessed WHILE the file is being written. We also need the next line, which uses “NSFileProtectionComplete” to protect the file “at rest” – i.e., while not being accessed. You’ll get the best results when the user has a passcode lock on their device – your app can only be ready for the user to protect themselves. Protecting the file while it is being written is important because you don’t want to give someone the chance to modify your file while its open (being written to) such as changing/deleting content or, in a more extreme case, copy the contents somewhere else. There is a small chance of this on an iOS device and is mostly related to the Mac but it’s still good practice all around (plus, you never know when you’ll be porting your iOS app to the Mac :)). The same goes for NSFileProtectionComplete in that you don’t want to allow the file to be accessed while the device is locked because that could mean something bad is happening in general (such as the phone being stolen and the thief is trying to pry open the users data). In the spirit of full disclosure, saving to the Documents directory is admittedly less secure than say to Caches (NSCachesDirectory) or Temp (NSTemporaryDirectory) directories but its more well known and easier to use as an example in the blog post since people know where to look for it. Conversely, never save sensitive information to NSUserDefaults – these values are stored in PLAIN TEXT (i.e. just like this blog post) for all to see (and is also saved inside of your application bundle). Be mindful of what you put in there. From here, we’ll detour to create a table cell that we are going to use to help simplify our custom table cell code. 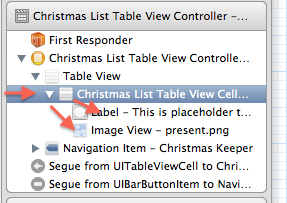 Let’s take a break from code for a minute and hook up this class with our UITableViewCell inside of our Christmas Presents Table View. Head back to MainStoryboard.storyboard and select the cell inside of the Table View called “Christmas Keeper” – I find it easiest to click just to the right of the Disclosure Indicator. Then bring up the Identity Inspector and change the “Class” property to be our newly created ChristmasListTableViewCell class. Then Control+Drag from the Table View Cell to the UILabel and to the UIImageView to hook up the outlets we made. Everyone does this their own way, but I find it easy to do with the Document Outline (the view to the left of the Storyboard). Build and run real quick just to make sure everything still runs (although it still won’t display any presents quite yet). 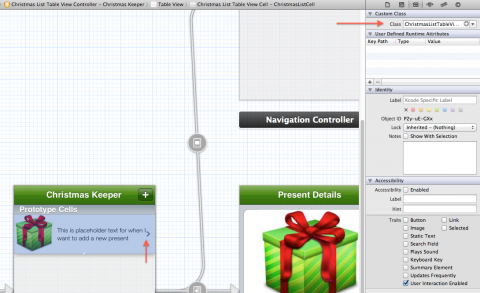 Now we need to create two more view controllers – one to handle adding new presents and another to show the presents. Create a new file with the iOS\Cocoa Touch\UIViewController subclass template, enter AddChristmasItemViewController for the class, make it a subclass of UITableViewController, and leave both checkboxes unchecked. // This delegate is used to send back the newly created present to the Table View. // Set source to the Photo Library (so it works in Simulator and on non-camera devices). // Once the user has made a selection, the delegate call back comes here. // Access the original image from info dictionary. // Capture the file name of the image. // Then save the image to the Documents directory. // Being proactive as the ImagePicker takes a while to load. // The user can tap the cell (where the present image is) to change the photo. // If the user just presses "Done" without setting an image, this would be blank. // Check to make sure we have a delegate and that it implements our method. Charlie Sheen loves storyboards too! We’re going to benefit from Storyboards especially in this class, as you’ll notice that we don’t have to worry about creating the cells, number of cells, etc. And we don’t have to deal with the UITextView that we have in our static table. 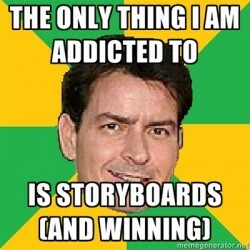 #winning! What we are doing in this class, however, is catching when a user presses on the table cell that houses the present image. We cause this to bring up the photo picker, though we could use the camera as well. When the user selects a picture, we save a copy to our Documents directory so we have it locally. Lastly, we update our delegate to reflect that we have a new present added. Creating our second view controller will be easier than the first! Create a new file with the iOS\Cocoa Touch\UIViewController subclass template, enter ChristmasDetailsTableViewController for the class, make it a subclass of UITableViewController, and leave both checkboxes unchecked. The purpose of this class is to show the details of the present and to provide the user with the option to tweet about it (really just an excuse to try out the new Twitter API :]). As we’ll see in a minute, the details about the present are passed forward to us, so all we need to do is go find the image on the disk and display it, as we’ve already gotten the text from the sender. The tweetButtonTapped: code is copied straight out of the great Twitter API tutorial on this! Gotta love “plug and play” code. Step back to the MainStoryboard.storyboard file and change the “Class” property on the Add Table View Controller and the Detail Table VIew Controller scenes just like we did for the Table Cell. Set them to their respective new files and don’t forget to hook up the corresponding outlets. Build and run again to ensure it still runs (although it still won’t display any presents you add). Now that we have our data model, table cell, and detail view controllers implemented, we can turn our attention back to the Christmas Present Table and start hooking things up for the big finale. Create a new file with the iOS\Cocoa Touch\UIViewController subclass template, enter ChristmasListTableViewController for the class, make it a subclass of UITableViewController, and leave both checkboxes unchecked. Here we are going to use the model that we created (ChristmasItems) to easily keep track of presents. We also need to save the selectedRow to pass forward to our detail view that you’ll see in a minute. // Register for the Data Protection Notifications (Lock and Unlock). // ** NOTE ** These are only enforced when a user has their device Passcode Protected! // We still must manually remove ourselves from observing. // This method will get called when the device is locked, but checkKey will not. It is queued until the file becomes available again. // I've seen very sporadic results with iOS 5 as to whether this method executes. Another fairly straight-forward class, thanks to the awesome power of iOS 5! In this case, we aren’t doing anything security-wise, we are merely calling the dummy methods “deviceWillLock” and “deviceWillUnlock.” However, you can do anything you need to here. You may want to delete files, log the user out, prompt them for credentials when the device is unlocked again, etc. Also, because we are ARC-enabled, we don’t typically have a dealloc method, but in this case it’s needed. This is because we have to remove ourselves from listening for the Data Protection notifications when the instance of our class is released. Note: The data protection APIs are not available in the Simulator, so you must be on device for this test to work. Moving down to the Table View Delegate methods, you can see that we are accessing our array in the ChristmasItems model to return the count. This is followed by dequeueing a reusable cell from our table view. You may wonder where all of my code went for if(cell == nil), etc. In iOS 5, Apple has said “dequeue a cell and if one exists you’ll get it, otherwise we’ll create a new one for you!” Sweet! This simplifies and removes code so that we now only have to deal with the contents of the cell directly (in our case, the textView and thumbnail). In the commitEditingStyle method, we are utilizing those helper methods we created in the ChristmasItems class to remove the gift. Then we update the table view. You can also see that we implemented our delegate method for the AddChristmasItemViewControllerDelegate. This allows us to add new presents passed in by the user. Lastly, in our prepareForSegue method we are checking for the Segue from a user hitting the + button or tapping on a cell. If they want a new present, then we set ourselves as the delegate (to get the addChristmasItemToList delegate callback). If it’s a details view they want, then we pass forward the details of the present. Make one last trip to the MainStoryboard.storyboard file, and update the “Class” property on the Christmas Keeper Table to this class (ChristmasListTableViewController). Take a deep breath. And build and run. If everything went as planned, then: Our app. Is. Done! Time to party like it’s the end of the year! Update 4/6/13: Here’s an updated version from Blake Loizides – modified to remove deprecation warnings in iOS 6. Congratulations, you’ve covered the basics of security in iOS 5 and are ready to start using it in your own app – no more excuses! Hopefully this tutorial has gotten the point across that security is necessary but shouldn’t be intrusive (I’ve tried to sneak security features past you and then talk about them afterwards to demonstrate my point). We’ve learned A LOT about security here – the iOS Keychain, Data Protection APIs, hashing and cryptography algorithms, and the new Secure Alert Views! Give yourself a pat on the back – it was a journey. I hope you enjoyed this tutorial! As always, if you have any questions or comments on this tutorial or security in general, please join the discussion below!